Chinese new energy giant BYD has kicked off its bus chassis production operations in Brazil with the launch of a new electric bus model in the nation’s capital, Brasília. The new model was designed in partnership with Marcopolo and utilizes a BYD rolling chassis that has been married with a Marcopolo Torino body. Mr. Rollemberg isn’t just talking about encouraging the transition — he’s actively working on it with plans to apply tax incentives for electric buses used for public transportation as a means of kickstarting the Brazilian transition to clean energy buses. The partnership with Marcopolo allows BYD to contribute with its strongest technologies — the powertrain and batteries from its factory in Campinas — without having to build a local factory to build the entire vehicle. “We are happy to deliver the first electric bus project together with Marcopolo. 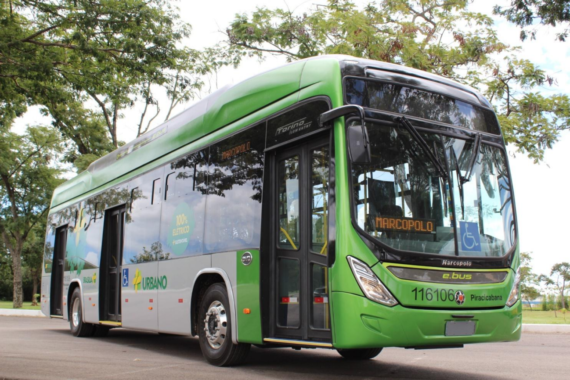 We are creating jobs in Brazil and helping Brasilia improve its bus system,” said Tyler Li, General Manager of BYD Brazil and President of BYD Energy Brazil. The new D9W is fully electric, has a range of 300 km, and is already seeing strong demand locally due to its zero-emission powertrain and quiet electric motors. With the Marcopolo cab bolted on, it also offers all the features of traditional transit buses, like air conditioning and pneumatic front and rear suspension, while slashing maintenance costs due to the impressive reduction in complexity that comes along with its electric drivetrain. BYD estimates that each of its buses reduces an equivalent of over 1.8 tons of CO2 per year compared to a diesel vehicle, which is on par with planting more than 11 trees per year. Swapping out diesel buses for electric buses also provides a noticeable boost to city air quality. Heavy diesel vehicles are sources of nitrous oxide (NO) and particulate matter, both of which have been shown to be extremely harmful to public health.